I just got back from a weekend trip to North Carolina this morning (Thomas’ grandpa’s 80th birthday) and I am exhausted! We like to get up really early to make the drive–we were on the road by 4:30 am!–so that we can be home early and still have a day to relax. Unfortunately, I have had what I call the “ominous sore throat” the past few days and I think it is transitioning into a cold now. I just hope not the flu–I have at least 2 students absent in every class with the flu. Oh joy. I wanted to post something today since I was absent from the site this weekend but seriously lack the energy to cook or write anything lengthy. So I give you one of my favorite snacks, usually enjoyed with a glass of wine (but I have declared today an alcohol free day. For now.) My mom introduced me to this wonderfully crunchy, creamy, salty combination and there are days like today when I crave it. I plan to much on these crackers and curl up on the couch with a movie. 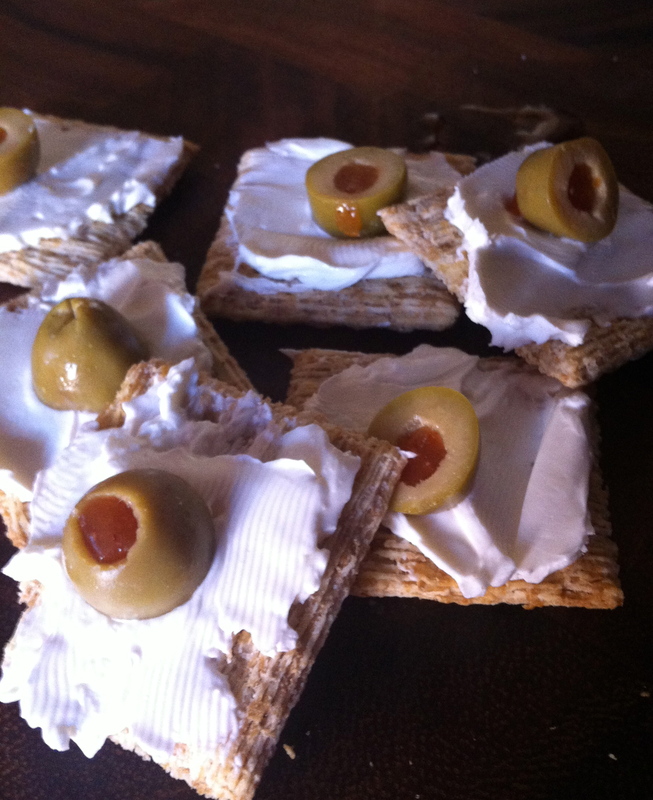 All you need to do is top a triscuit cracker with cream cheese (Philadelphia is the only one I like, it isn’t sweet) and a slice of green olive.